Hello lovelies! It’s been a little while since i revealed some of our reno stuff but i’m thrilled to say i’m finally ready to show you what our bathroom looks like. We’ve now lived in our new home for 4 months and it feels like we’ve been here forever. Of course there are still elements we need to get done but the body of the house and interiors is there – now we’re finessing. 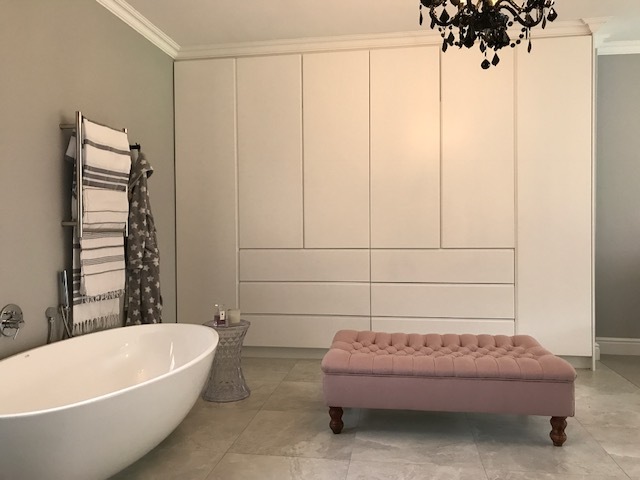 The bathroom area consisted of three little rooms – a dressing room/cupboard area, a loo to the left and a poky bathroom to the left of that…all very poky and squashed. 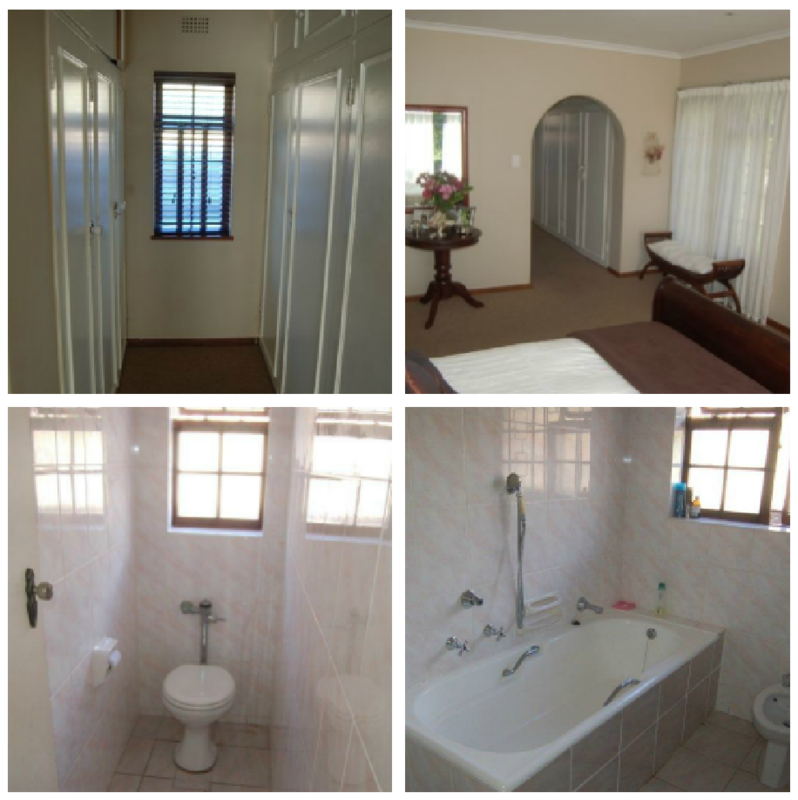 We wanted an open plan space that included our cupboards and our bathroom. We closed up the window in the original dressing room and left the others – just painted them white. Last year i did some work with Womag and i fell in love with their marble look tiles and their Deco Heritage patterned tiles. 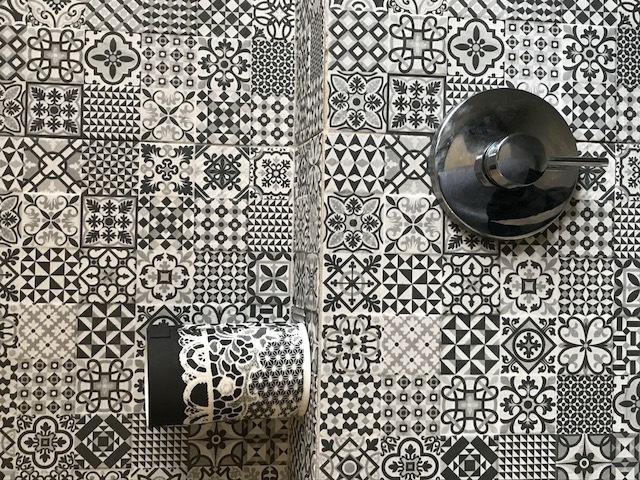 We had no plans to move at the time but i knew without a doubt that sometime in my life i was going to have these stunning patterned tiles and some marble somewhere! 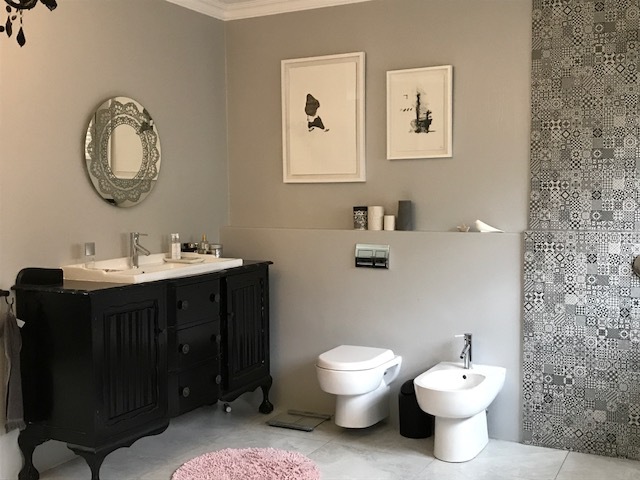 When we bought our home and i saw the original bathroom setup – one the one hand my heart sank (hideous) but on the other hand i was thrilled because i knew once we gutted everything we would have a completely blank canvas with which to play! My goal was to have a bathroom that felt like it belonged in a hotel. 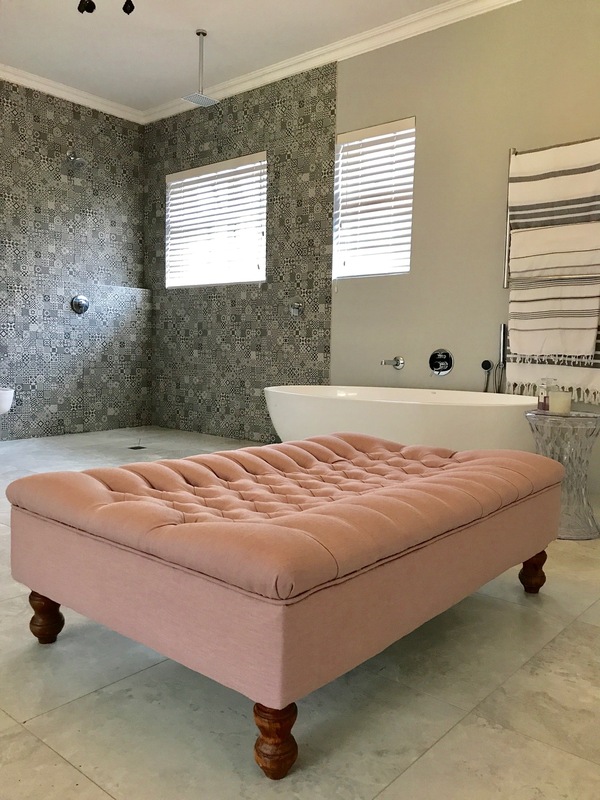 We lived with the grey and white for a while but it just felt too meh – and then i spotted this absolutely beautiful hemp cotton from Hemporium and i knew it would be perfect for the ottoman i’d had in storage for a few years. We should have painted the legs black before having it re upholstered – the wood looks a little scuzzy! Our windows are those old school ones where you can’t see through the glass – i am NOT a fan of them but you need them. 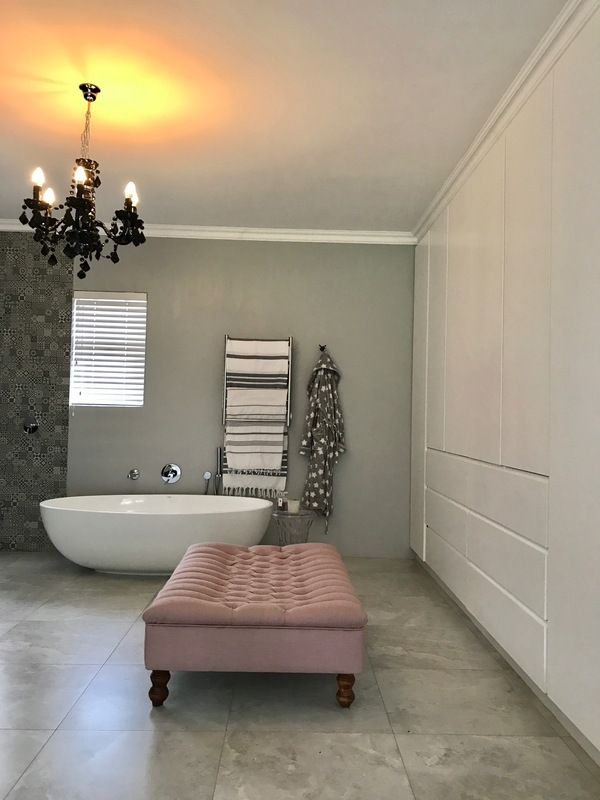 Eventually i couldn’t handle looking at them anymore and i spoke to the folks at Taylor Blinds – not only were they really well priced – but the process was seamless – from measuring to fitment took just a few days. They did not leave a speck of dust behind and the blinds framed the windows perfectly from the minute they were installed. I’m so happy with them. Here’s a closer look at the marble floor tiles from Womag – i absolutely LOVE them! The large format feels really luxurious and so do the narrow grout lines. They’re so easy to clean and just add a sense of luxe to the bathroom from the get go. 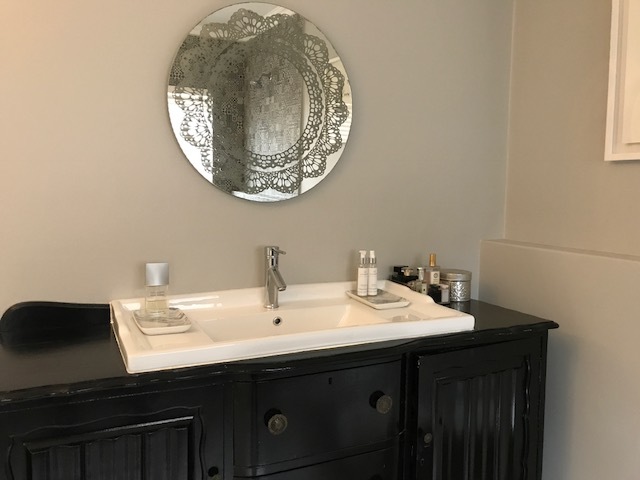 Some other details: the towel rail is from Stunning Bathrooms (a fraction of the price of other ones we costed) and so is the hook which they powder coated black for us. The bath is from On Tap and the taps are from Italtile. 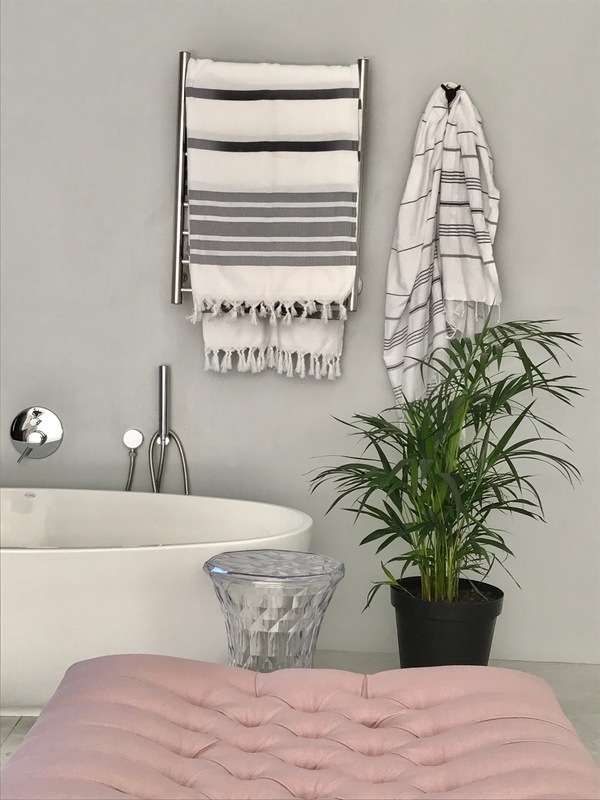 Don’t you love the Turkish towels from Mono? I love them! Our cupboards were made for us by Marke, The Cabinet Minister and he did a really fabulous job – they are sprayed in a white satin finish and as with our kitchen we opted for deep drawers as i find you don’t use shelves to their maximum – i manage to fit all my underwear plus socks and tights just into my top drawer – they’re that big. Since the pic above, i switched things up with a plant from Stodels – i love it! I think I’ve shown you our bathroom vanity before too. I searched for it on Gumtree for ages and eventually found one at a price i liked in Joburg. I managed to bargain with the seller a bit and used the difference to pay for the transport to Cape Town. Our carpenter dropped in the basin and we simply painted the unit in a high gross black enamel. Next time i think we’ll have it sprayed for a more uniform and professional finish. Here’s a closer look of the vanity – i’ll change the handles when i get a chance. Here’s the view of our cupboards – the ottoman has proven to be real useful. We had a grey rug underneath the ottoman but it isn’t practical as it doesn’t dry very well so i need to invest in an Inside Outside rug from Airloom as these can handle moisture. We got it to a certain point and then i was a little stuck and not altogether happy – eventually i realised it was because the wall colour was ALL wrong! The white was too white and it made the tiles look funny – too out there! A quick visit to Prominent Paints and a half day paint job of a beautiful pale shade of grey completely transformed things and married so well with the Womag Decor Heritage tiles too! 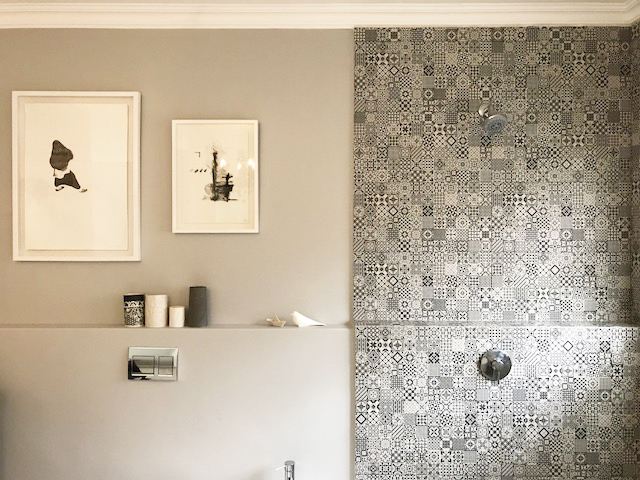 The colour i chose from Prominent Paints is code NCS S 1005-R80B) and we actually ended up painting a feature wall in our bedroom in it too – its really easy on the eye and a light and lovely neutral. 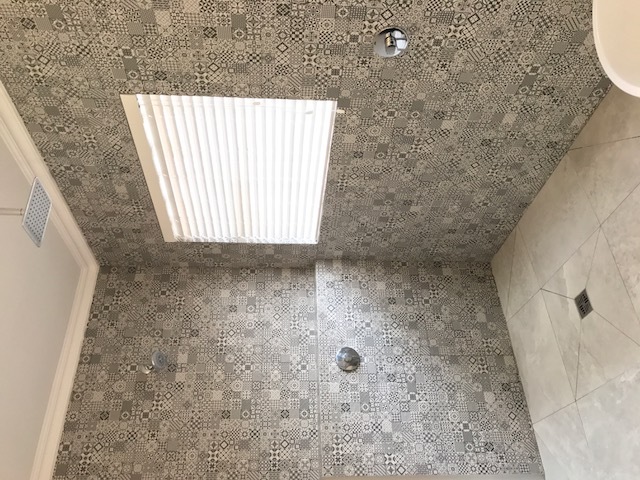 I knew from the get go that our shower would be lined with Deco Heritage tiles from Womag. They are so beautiful and its the first thing people comment on when they see our bathroom. 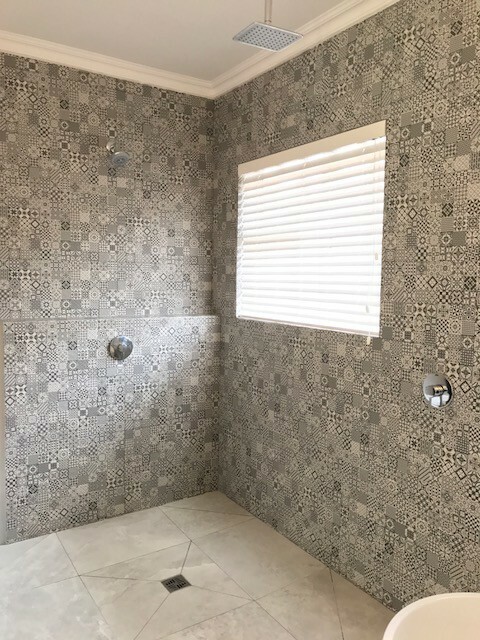 We opted for a wet room effect with two showers – one for me and one for The Captain (i’m not a fan of overhead showers) and we’re loving it. Here’s a close up of the Deco Heritage tile – it’s actually one large tile designed to look like loads of small ones. 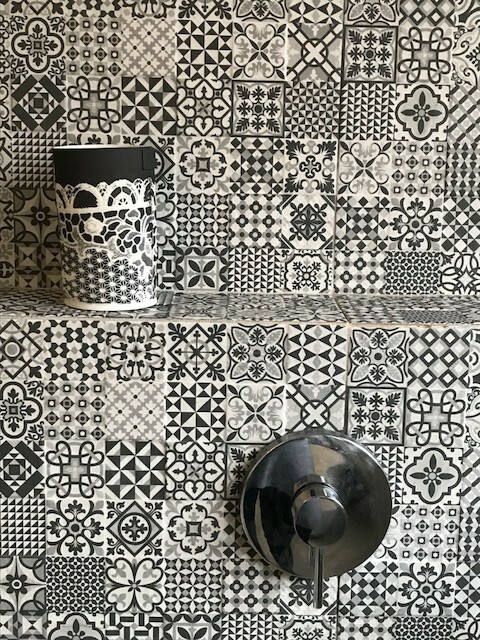 Its 32×62 cm big- this makes getting the Moroccan tiled look really cost effective as you need far fewer tiles to fill a surface. I highly recommend doing things this way. So, there you have it my lovelies – i would LOVE to hear your thoughts and of course if you want to know anything about the process please let me know. You have exceeded your goal!! I could live in this place. So luxurious and sumptuous. Like a stunning hotel room you never want to leave. Love all the light feminine touches and really loving the glamorous chandelier. PS. When you eventually get tired of your ottoman, I will be ready and waiting. 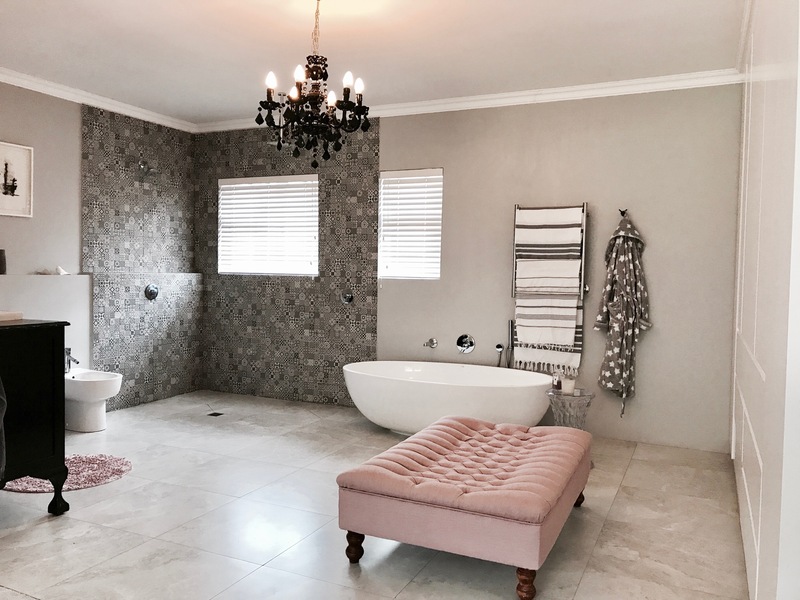 Congrats – fantastic bathroom. So beautiful Vix!! I would spend a mound of time in here I think! wow, it is really great ! I was wondering where the shower was, as I dont like bathing, and then I saw it, right there.